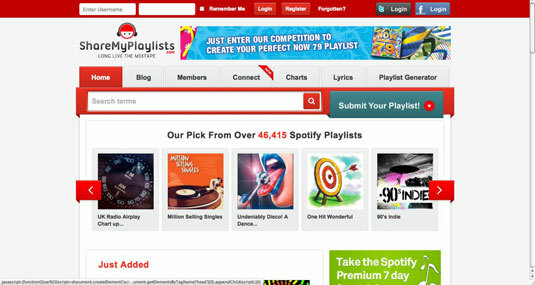 ShareMyPlaylists (or SMP, for short) was one of the first Spotify playlist–sharing sites around and still continues to innovate and deliver new features to visitors. The site’s mantra is “Long Live the Mixtape,” and here, you’ll find plenty of creations painstakingly compiled by thousands of users. After you create a Spotify playlist full of your own personal song selections, you can copy the link and submit it to the site, along with a brief description, to let other people listen to it, too. And, of course, you can discover loads of new playlists that have been submitted by others! Currently, lucky SMP is the only site allowed to use Spotify’s playlist data for development purposes (as opposed to just the track, album, and artist information that other developers are using). Playlists: Apart from submitting your own playlists to the site, you can search for playlists by genre, browse the newest selections, and check out SMP’s featured playlists. Members: You don’t need to be a member of the site to listen to play-lists, but registering (for free) gives you greater benefits — you can immerse yourself in the community and follow profiles of people who’ve submitted playlists that caught your eye. Every profile lets you add friends and leave messages on each others’ profiles, too. See the following section to find out how to register. Connect: The newest feature to grace SMP lets you connect your Last.fm account and Facebook profile to the site. After you do, you get a list of recommended artists. You can remove a suggested artist as a favorite so that it doesn’t appear again, generate a playlist based on a recommended artist, or view an artist biography. Playlist Generator: Type at least one artist name into this generator, then opt to receive either popular or obscure tracks, and SMP delivers an automatically generated playlist related to the artist (or artists). Lyrics: You can view song lyrics for any track that appears in a play-list by clicking the track’s title, or just click the Lyrics tab to conduct a search. Charts: You can view the most popular playlists for that week — determined by the number of times people click Play next to a playlist’s Spotify link. Typically, hot charts can receive thousands of plays. Badges: For those of you who enjoy earning achievements while playing computer games, you’ll like the concept of earning virtual badges for attaining certain milestones. Open to registered users only, the badges recognize events such as 50,000 plays of your playlist or submitting a playlist that ends up on the site’s Featured section. 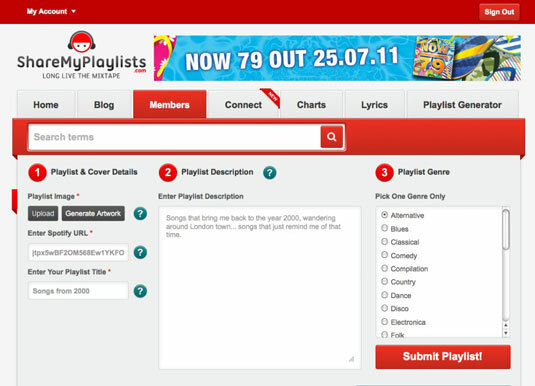 Badges are also awarded for playlists that stay on the site’s charts for a number of successive weeks. You can proudly display the badges on your SMP profile for all to see. Blog: The folks running SMP know how to deliver some eloquently scathing music reviews! Apart from picking apart the latest Kings of Leon offering, the blog delivers weekly playlist highlights and frequent updates about what’s happening at the SMP HQ. Merchandise: Among other selections, SMP has shirts for sale emblazoned with the Long Live the Mixtape slogan.